Caption slip continues: "Photographer: Olmo....23/24: Chimps (Sally on bottom, Gus tp) are careless about table manners as Keeper Roger Bearanchi feeds them a choice fresh fruit plate of grapes, bananas, apple, melon and apples. 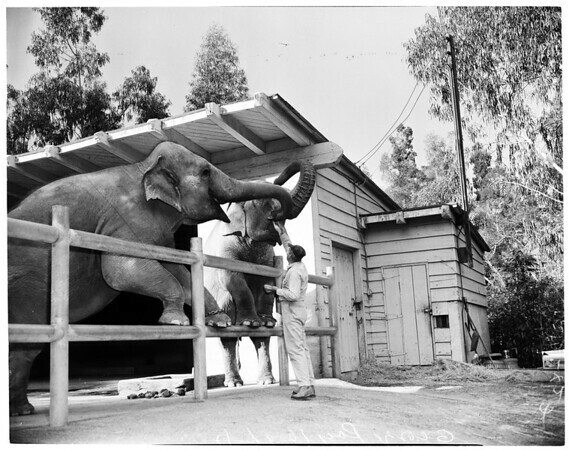 27/28: Keeper George Ray feeds carrots to Joyce, 6, and Bojo, 5, elephant 'sister act' at Griffith Park zoo. They also get hay, grain, fruit and bread. The pair beg like puppies for dainties. 29/30: Keeper Bob Burt bottle nurses month-old Nilgai (Indian antelope) fawn at Griffith Park Zoo. The baby, nicknamed Kip (short for Kipling), takes quart of goat's milk each nursing".